Quilts are meant to be snuggled under --- right? So often we treat the back of the quilt as an afterthought. It's easy to use muslin, because it matches everything. And who's going to see the back, anyway? The answer is --- you are! If you will be using the quilt on a bed, or in your family room to snuggle under, you really need to put a bit of thought into the back side of your quilt. There are a lot of alternatives to the plain beige muslin of yesteryear. Now we have tea-stained muslins to choose from, and some of them are beautiful. Keep in mind that you may have a seam in the center, so take that into consideration if it will have an effect of the way the back of the quilt looks when it's finished. Another alternative is a wide back fabric that is becoming more available every day. These fabrics often have gorgeous prints --- but you may have trouble finding one that matches your quilt top in color tones. 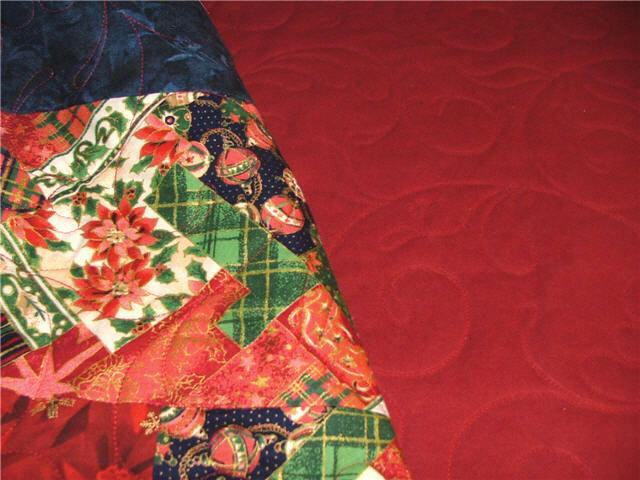 That leaves us with the third choice of using one or more of the fabrics from the front of the quilt. Now you have a perfect match --- but did you plan ahead when you bought the fabrics for your top so that you would have enough to piece the quilt back? You can always piece together the leftovers from the front, and hope that the back looks like it was planned that way...... but do you have the time or the energy to do that? My favorite quilt back has become flannel. It's widely available in solids and prints, reasonably priced, washes well, and the best part is that it's SNUGGLY! The quilting looks wonderful on the back of the quilt, and you may find yourself enjoying the back as much as you enjoy the front! My friend Karen has been using flannel on lots of her quilts, and I really enjoy the final effect! She will be able to enjoy snuggling under this quilt all through the holidays!